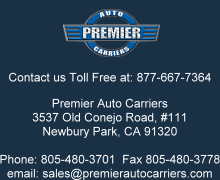 Premier Auto Carriers owns and operates a fleet of fully enclosed, state of the art, 6-7 car transporters. 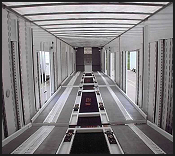 We have both lift-gate and ramp style trailers that accommodate all types of automobiles. Each trailer is equipped with a "soft-tie" securing system that insures each vehicle is secured properly for a safe and worry free transport. All of our equipment is maintained at regular intervals to insure proper operation, minimilise downtime, and comply with all US DOT regulations. All of our drivers are veterans of the automobile transport industry. Many of them have been with Premier since the beginning and they pride themselves in caring for your vehicle as if it was their own. They are highly trained, courteous specialists that have over 120 years of combined experience. Before hiring we require that they have a minimum of 5 years experience in the enclosed auto transport industry. Additionally we do a thorough investigation of their previous employment history and motor vehicle record. Each driver is also required to participate in a random drug and alcohol testing consortium.